that you had stolen this image-object from the world. You had transferred a piece of the past into the present." Der Himmel über Berlin (Wings of Desire - the German title is so much better) has always been one of my favourite films ever since I saw it at university as a student of German. So for all sorts of reasons I was delighted to be able to review his collection of essays, The Pixels of Paul Cézanne. 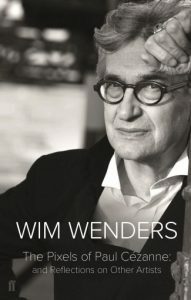 Just like the camera in Wim Wenders’ films, his writing demands the “freedom to move”: “I need to be able to ‘circle’ an idea”. For this reason he chooses to write in free verse – or what he modestly refers to as “my odd verse” – for many of the essays in this illuminating collection. In his hands it becomes a playful and wonderfully malleable literary form that allows him to create a flow of images and ideas, a kind of rhythmic thinking: “visible blocks of thought”. Each line becomes a separate tracking shot as the writer-director moves restlessly around his subject, words crystallising into ideas in the same way as a narrative emerges during the editing of a film. Read the full review at the Guardian.